Heathlands are characteristic habitats of cool, moist, temperate western Europe. In Britain they are considered as either lowland heaths or upland moors. In continental Europe they are usually lowland coastal heaths. Although all three are similar the soils tend to be different. Lowland heaths develop on sandstone whilst on upland heaths the rock will be resistant, non-calcareous rocks. Continental heaths can often be found on limestone. Heathland is not a climax vegetation but a transient community. Their maintenance has been largely under human influence, for example, fire has reduced the colonisation by birch and pine. The name comes from the dominant plants, heathers, such as Ling and Bell Heather. Gorse is also abundant. They are typically found on poor, acid, often sandy, well drained soils. Decomposition is slow with a build up of raw humus. They are all wind swept, which produces a high transpiration rate, and possible bud damage. Temperatures at ground level fluctuate widely, diurnally and seasonally, because of the limited cover afforded by the low vegetation. On uplands there is a mosaic of vegetation which develops, often due to sheep grazing and waterlogging. The latter leads to an increase in peat growth. All heaths are disappearing at a frightening rate. Lowland heaths are the rarest habitat in Europe. The burning of upland moor has maintained some moors, encouraging growth of young shoots for grouse and red deer. There have been extensive losses of upland moor with the formation of pine plantations and birch invasion. Mature heathers can produce densely shaded areas and ultimately result in a two-layered, vertical distribution. Bilberry leaves show morphological differences depending on whether they occupy the shade or sunny side of the heather bushes. Lichens are typical heath organisms and, with mosses, produce ground cover. 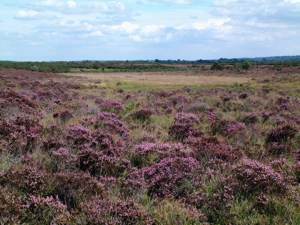 A flat heath will be well drained but retain a moist surface which is dominated by Ling. At the top of a slope drainage is most efficient and the resulting drier soil may be dominated by Ling and invaded by bracken. Plants living here are xerophytes: plants adapted to a very dry environment. They have needle-like leaves for reducing surface area, e.g. gorse. Aspect of the site is an important factor. South facing slopes will be drier and warmer up slope but cooler and wetter down slope; north facing slopes do not tend to exhibit such pronouced zonation of conditions and of communities. At the bottom of the slope water collects above the iron pan and there is a transition to wet heath dominated by Cross-leaved Heath, E. tetralix. Bell Heath, E. cinerea, will disappear but small clumps of Ling may just survive the wet conditions. Where waterlogging occurs in the valley bottom Sphagnum mosses take over; “floating” on the surface they become the substrate for rooted plants, e.g. Bog Asphodel. Splits may occur in the moss “skin” which produce bog pools containing aquatic insects and spiders. The wet parts of the bogs have insectivorous plants, e.g. sundews, growing. Sphagnum bogs have an annual surface growth of mosses. Each year the lower part of the moss dies and accumulates to form peat. (i) SOIL PARTICLE SIZE & WATER RELATIONS. Sand particles, the typical podsol substrate, are large and this, in turn, creates large air spaces. Drainage is rapid removing important minerals especially nitrogen and phosphate. 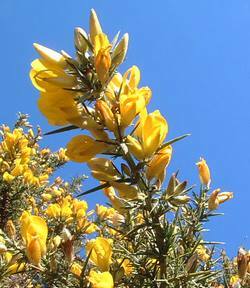 Heathers and gorse have mycorrhiza and root nodules, respectively, which help in mineral ion and water uptake. Low soil humidity restricts plant species to those able to reduce transpiration (xerophytes) and is the main reason for few soil animals, e.g. woodlice and earthworms. The restricted water supply for animals increase the survival value of water conservation adaptations. Insects, spiders, reptiles and birds are all uricotelic, i.e. excrete uric acid which requires less water. (ii) CALCIUM CARBONATE and pH. This compound is largely absent from heathland soils and accounts for the specialist flora (calcifuges) and fauna. Lack of calcium will restrict shelled organisms and so molluscs are rare except for occasional slugs such as Agriolimax. pH affects soil nitrification, which ceases below pH 5, with little or no nitrogen present. (iv) WATERLOGGING. This drives out oxygen from the soil. Under anaerobic conditions any soil nitrogen may be converted into nitrogen gas and thus become unobtainable by the plants. pH changes also occur. Infections to roots increase and obtaining oxygen through the roots becomes an impossibility. Rushes and other adapted plants have aerenchyma tissue which brings air down from the stem. Reptiles will become replaced by amphibians. 2. TOPOGRAPHY. Sloping heaths will have a greater variation of communities. It affects water distribution and aspect. The high ground will have least water whilst the hollows will be damp and encourage Sphagnum mosses. 3. ASPECT. This is the direction in which a slope faces. A southern aspect has more illumination and warmth, but dries faster; a northern aspect is cooler and darker. Thus on a north facing slope vegetation changes will be less marked. 4. ATMOSPHERIC HUMIDITY. High humidity of the air will increase the speed of Sphagnum moss growth. Thus areas of high rainfall have extensive Sphagnum areas both in depth and distribution up hillsides. Transpiration by plants will be affected by the humidity. 5. TEMPERATURE. Heathland has a very variable diurnal temperature. Animal activity is affected by temperature and so we expect to see associated patterns of behaviour in the fauna, e.g. reptiles sunbathing and molluscs emerging only at night. Grasshopper and cricket growth and feeding is determined by temperatures. Although endothermic animals have a degree of independence their food sources will be affected and so behavioural responses must be adjusted. For example, migration, hibernation or change of food source. High temperatures will affect transpiration. 6. WIND & SHELTER. Air movements are predictably high, reducing temperatures and increasing transpiration. Animals take shelter between heath bushes. Many small insects remain within the microclimate of a single heather bush. Large predators may hunt on the heath but nest elsewhere, e.g. kestrel. 7. FIRE. This is a major limiting factor for the establishment of trees and large bushes. Its presence will halt succession. Due to the dry nature of the heath it can be a regular factor in some habitats. The time of the fire is crucial and its occurrence in early summer can be devastating to invertebrates and reptiles. Intense fire burns the upper horizon of soil and destroys seed banks. 8. BIOTIC FACTORS: Since myxomatosis heathlands have becoming increasingly acidic due to the reduced grazing by rabbits. Lack of grazing allows the increase of heather and gorse, both of which produce very acidic litter that affects the soil.